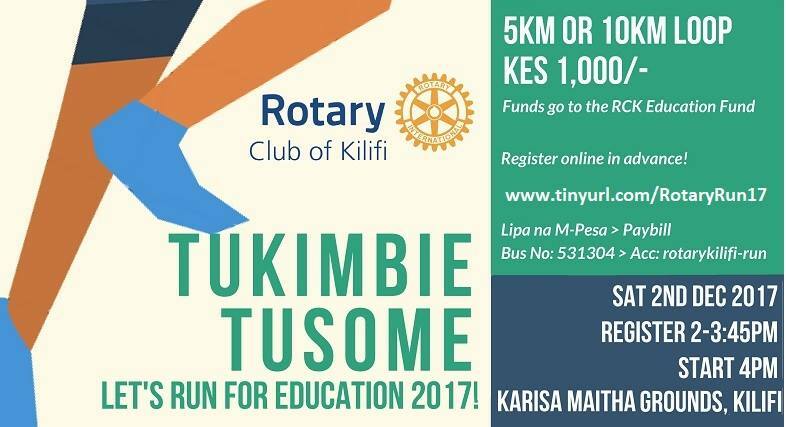 KeshoUK trustees Pauline Lowe and Geoff Powell are taking part in the fifth annual Kilifi Rotary Run For Education - Tukimbie Tusome, raising money for the Rotary Club of Kilifi Education Fund! A 5km or 10km loop starting at Karisa Maitha Grounds, and taking in the Bofa area, the run starts at 4pm and ends with a celebration and prize-giving at 6pm. Rotary's target is Kes 319k, which is the average amount a student attending secondary school will need to find. This puts education, which we believe is a right not a privilege, out of reach for many young Kilifians. Help us send bright but financially disadvantaged students to school. The Rotary Club of Kilifi Education Fund is used, among other things, to assist Kesho Kenya students and projects.